ISTS and IWTDCS Committee welcome you to the ISTS and IWTDCS 2018. All ISTS and IWTDCS 2018 participants are invited to join the welcome reception. The welcome reception will be held at Alumni Hall, Ehime University. 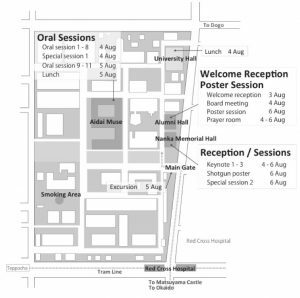 The location of Ehime University is HERE and please refer to the map below for the location of the reception hall in Ehime University. ISTS and IWTDCS 2018 aim to discuss about the analysis and the technologies on transportation field, especially on traffic simulations and data collections. The world’s transportation and traffic researchers and practitioners, as well as people who are interested in contributing to or gaining a deeper understanding of the transportation analysis are expected to join this conference. During the three-day conference, plenary sessions featuring high level speakers and interactive presentation sessions will take place at Ehime University, which is located in Matsuyama, Japan. The participants will have the opportunity to acquire both academic and practical innovative knowledge, and exchange their research results and operational experiences. This event focuses on scientific challenges in new theoretical development in the transport fields as well as the emerging technologies in data collection and smart processing tools for dealing with big data. Aug. 2, 2018 The way from the airport to downtown and sponsors are updated. Aug. 1, 2018 Excursion and Venue are updated. July. 24, 2018 Tentative Program is updated. July. 23, 2018 Program and instruction for Cycling tour is updated. July. 21, 2018 Program Outline and Tentative Program are updated. July. 19, 2018 Sponsors are updated. July. 17, 2018 Tentative Program and One keynote speaker has been changed. July. 10, 2018 Tentative Program and Keynote Speakers are updated. July. 4, 2018 Instruction for Presenters is updated. July. 2, 2018 Program outline and Tentative Program are updated. May. 21, 2018 Earlybird registration period has been extended to June 10, 2018. Apr. 23, 2018 Registration & Hotel Accommodation booking page is now OPEN. Apr. 06, 2018 Due date for Full Papers accepted is postponed to Mid May, 2018. Feb. 27, 2018 Due date for Full paper submission is postponed to March 16, 2018. Jan. 24, 2018 Full paper submission is now open in Submission page. Jan. 13, 2017 Excursion was updated. Dec. 28, 2017 Registration and Important dates were updated. Nov. 29, 2017 Program was updated. Nov. 29, 2017 Important dates was updated. Sep. 17, 2017 Registration was updated. Sep. 14, 2017 Submission was updated. Sep. 04, 2017 Call for Paper was updated. Jul. 18, 2017 This website was opened.